In June 2018, Hear the World received an e-mail from Tighe Baier, saying that her 12-year-old son Isaiah had written a diary about his experiences with hearing loss. In his hometown of Lubbock, Texas, Isaiah and his diary were already well known thanks to local news coverage. The book was selling so well that it had to be put on Amazon to meet all the orders. Isaiah wanted to donate the proceeds from his book to a charity. He browsed the Internet for a suitable recipient and found a video produced by the Hear the World Foundation. This video was about children who had received the gift of hearing for the first time – and they were smiling! After that, Isaiah’s biggest wish was to witness a child hearing for the first time and to see the smile on the child’s face. Isaiah decided to donate the proceeds to the Hear the World Foundation. Over time, his book sold so successful that Hear the World was able to donate an additional 30 hearing aids to its partner Sonrisas que Escuchan for children in need with hearing loss in Guatemala. Hear the World invited Isaiah to join a team of three Sonova volunteers who visited the project in February 2019. 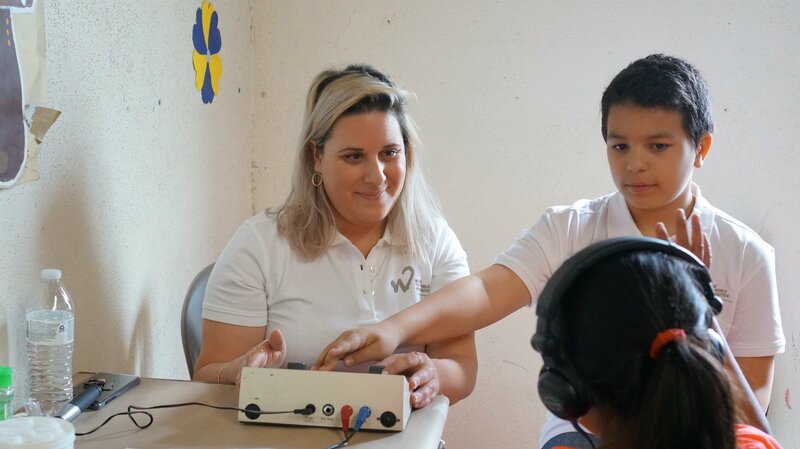 The goal of the visit was to fit the donated hearing aids and conduct hearing screenings at different schools in Guatemala City and Antigua. Isaiah was able to accompany the team during the first two days. 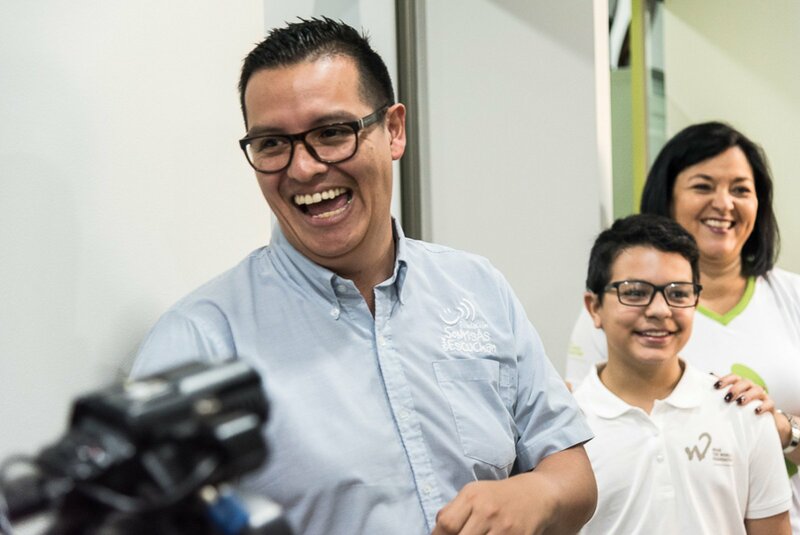 On the first day, in Guatemala City, his biggest wish came true: he was present when children with hearing loss had their hearing aids activated and were able to hear – again or for the first time. And those children certainly were smiling! As was Isaiah. To convey the scope of the project, the Hear the World Foundation also invited Isaiah to join the school screenings on the second day in Antigua. Schoolchildren aged 4 to 16 were tested for hearing loss, and their ears were checked for foreign objects and impacted wax. Isaiah had the chance to experience firsthand the different aspects of the project. Naturally, he also offered a helping hand to the Sonova volunteers. For example during the hearing aid fittings: Isaiah was ringing a bell behind the children’s ears and to see their reactions. On the second day, Sonova Israel volunteer Moran explained to Isaiah how to conduct a hearing test, and Isaiah supported the team in different tasks. By the end of his visit, Isaiah had also made many new friends. HTW wanted to know from Isaiah how he experienced the visit himself. HTW: Isaiah, when you were visiting the children in Guatemala, what was your most memorable moment? Isaiah: The experience at the clinic was eye-opening. In the US it’s so easy to get a hearing test. Here in Guatemala it’s very difficult. I feel blessed to have been able to help these children have the opportunity to hear again. I am glad that most of these kids are very young, so they will not be behind academically. How did you experience the children’s situation in Guatemala? Going to the school and watching the kids get examined was a surprising experience for me personally. Most of the children there had never had a hearing screening or even seen an ear doctor, ever! It was an honor to watch Hear the World helping these kids. It was a wonderful experience for everybody involved. Thank you, Isaiah, for spreading joy and happiness. You truly made a difference!